This photograph was taken by my sister Kathryn in 1995. 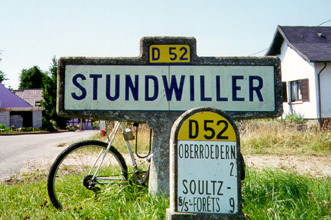 Stundwiller is the village where my Staebell ancestors originated. It is located in the northern part of Bas-Rhin, Alsace, France. Stundwiller is sometimes known (in German) as Stundweiler. Between 1746 and 1766 Stundwiller, together with Oberroedern and Aschbach, formed part of the community of Obergericht. These three communities were again merged 17 June 1974 under the name Stundwiller, and later separated once again into independent communities. 40 km NNE of Strasbourg. Henry ROMENS, born circa 1809, emigrated to Willoughby Township, Welland County, Ontario. He appears as Henry ROMANCE in the 1851 census of Willoughby. In the records of St. Joseph's Catholic Church near Willoughby, he appears as Joannes Henricus ROMAINS and Henerici ROMANZ, and his children appear with the surname ROMANS. He died 08-Oct-1889 at age 80. Anne Marie Philipps, born 1788, married Theobald Koabel of Oberseebach and emigrated to Welland County, Ontario.